"The event serves as a tribute to Ben Franklin and how he affects our lives," said Katelynn Moats, student coordinator and co-creator for Go Figure. 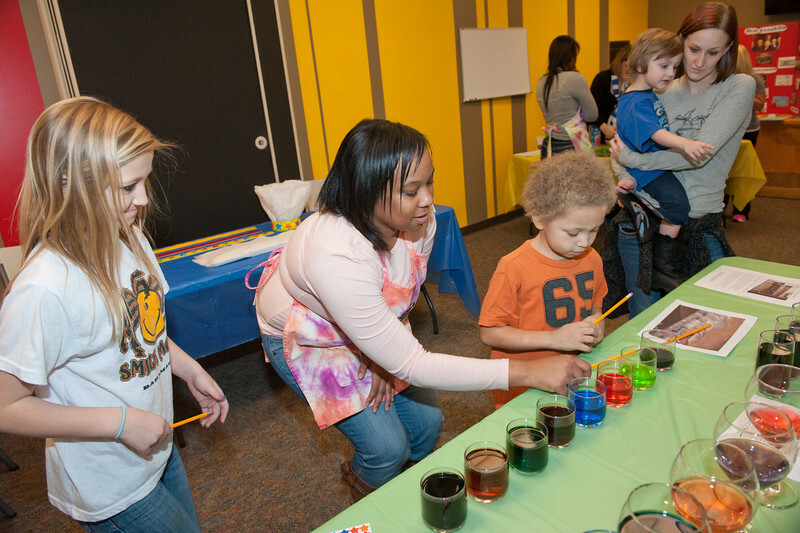 In addition to the permanent children's museum exhibits, the birthday bash featured stations that facilitated fitness, healthy eating and highlighted a variety of Franklin's inventions. Children received stickers from each station and earned the chance to win prizes. Borkowski, a marketing major from Dyer, Ind., helped children learn math skills at the Magic Square station. "We're making sure these kids get started doing these things early. It's a big thing because these kids will grow up and go to college, too," he said. Moats said that 15 ISU volunteers, including those from ISU's department of kinesiology, recreation and sport management, the Networks Scholars program, the ISU nursing program and the Arnold Air Society at ISU helped make the event possible. "It's great, because the ISU students have the opportunity to be role models for the younger students, as well as learn and discover with them," said Moats. In addition to the visit from Ben Franklin, famed nurse Florence Nightingale made an appearance. "Nightingale," otherwise known as ISU assistant professor of nursing Linda McQuiston, stood next to a table featuring strawberries, bananas and carrots, demonstrating healthy eating and proper hand-washing techniques. She noted the importance of involving nursing students in the day's events. "Nursing is not just in the hospital anymore. It's in the community," said McQuiston. It was her first time experiencing the Terre Haute Children's Museum and the Go Figure program. "This has been so much fun. I'm loving it. The kids are so into this," she said. In addition to the special stations, children took advantage of all the children's museum had to offer. Highlights included racecars competing down a metal mountain, the creation of paper airplanes, a bicycle exhibit, a water power exhibit and more. "It's full of fun and creativity," said Abigail Phillips, a student at Rosedale Elementary. "I love science. There's a lot of stuff for kids to play with." Her favorites were: the pollen basketball exhibit and the bubbles. "You pull the rope and the bubble pops around you," she said, being careful to note that only each person is allowed three turns before sharing with the next person in line. Moats said around 100 young students were expected during the day's event, which mixed creativity with learning. As he helped children with sand art projects, ISU junior electrical engineering major Jason Kays explained the purpose of his group's presence at the event. "Each year, the Arnold Air Society votes on a joint project early in the year. We chose to focus on STEM," said Kays. STEM stands for science, technology, engineering and mathematics, which the society helps promote learning of in schools. He said he enjoyed the birthday bash, noting that the Arnold Air Society volunteers the first Saturday of each month at the Terre Haute Children's Museum. "I love interacting with kids," he said. Borkowski echoed a similar thought, saying how he enjoyed interacting with different age groups. "Even if you're involved on campus, you don't get the chance to be around kids that often. It's fun to be in an environment where they're having fun, too. And, I mean, I'm dressed as Ben Franklin," he joked. 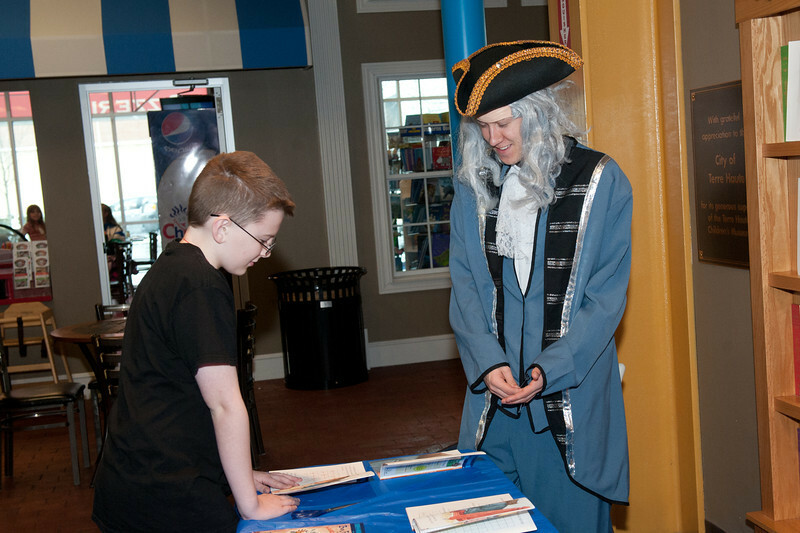 Ben Franklin's Birthday Bash at the museum served as a preview day for Go Figureâ€™s â€œFocus on Fitnessâ€ series.